We are one of the leading manufacturers, exporters and suppliers of Shoe Cover and Dispenser. All these shoe covers and dispensers are manufactured using superior quality non woven fabrics in accordance with international quality standards. These shoe covers are widely demanded by our clients for its excellent features such as high level of protection against all kind of microorganisms and non slippery texture. Our clients can avail these shoe covers and dispensers from us in various sizes and colors by paying through varied paying modes as per their ease. We design and manufacture shoe covers that are used in regulating and preventing infections and contamination during critical conditions. 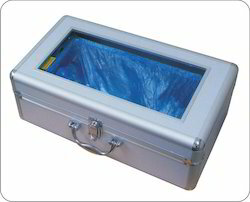 These are widely used in clinics and other health and hospitality sectors. Our range of non woven shoe covers has non skidding soles that offer a firm ground grip. Shoe cover dispenser is a rapid and safe sanitary product for the protection of hygienic environments. With fine mechanical structure, it is simple to use and does not need electrical source. User just need to step into the machine and press lightly downwards and a shoe cover will automatically wrap the shoe. It can be widely used in houses, hospitals, hotels, factories, labs, clean rooms, museums, show home, airport buses and religious activity venues. 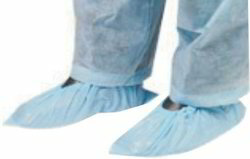 We also manufacture Shoe Covers Knee Length Plastic which is very useful for protection upto knee length and are widely used in Research Centers, Clinics & other Health and Hospitality sectors.